Patient will mild scarring can benefit from the procedure. A dermaroller is a hand held device with micro needles. Before starting the procedure, a topical numbing gel is applied to the treatment area for optimal comfort. During the procedure, the needles of dermaroller, create pores in the dermis, which encourage the release of growth factors and cytokines. The growth factors and cytokines in turn generate a wound healing cascade by stimulating collagen, elastin, and neovascularization. Needling sessions are typically done at an interval as suggested by Dr. Nivedita Dadu. During the procedure, we at Dr. Nivedita Dadu’s Dermatology clinic apply serums to the treated area, specific to your skin concerns: (hyaluronic acid, growth factors and skin boosters for ant aging); (for facial rejuvenation and glow, vitamin C serums and skin enhancers are used); (vitamin E and rosehip oils for stretch marks); (collagen and elastin containing serums for acne scars). 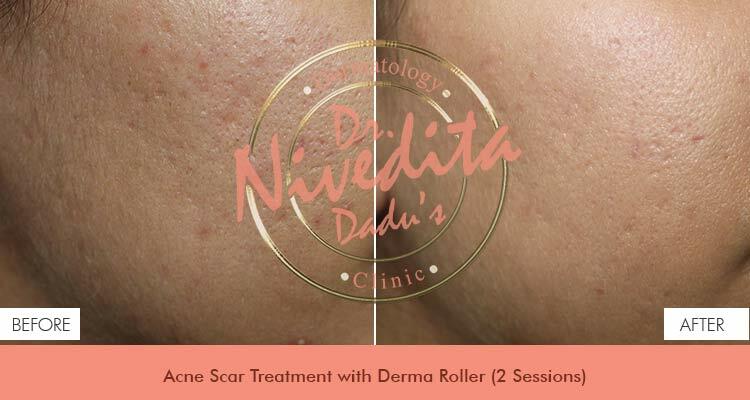 I am taking dermaroller treatment for my acne scarring, and with just two sessions, I am already seeing improvements. I am positive that at the end of all sessions, my skin will be completely healed with no scarring. Best place for skin issues.